« Do not park here. They will tow you. Is this good or bad for the neighborhood? Asbury Park gets an ocean front skyscraper. The Ocean Club, 1101 Ocean Avenue in A. Park. Opening soon. Blogfinger photo 12/4/18. 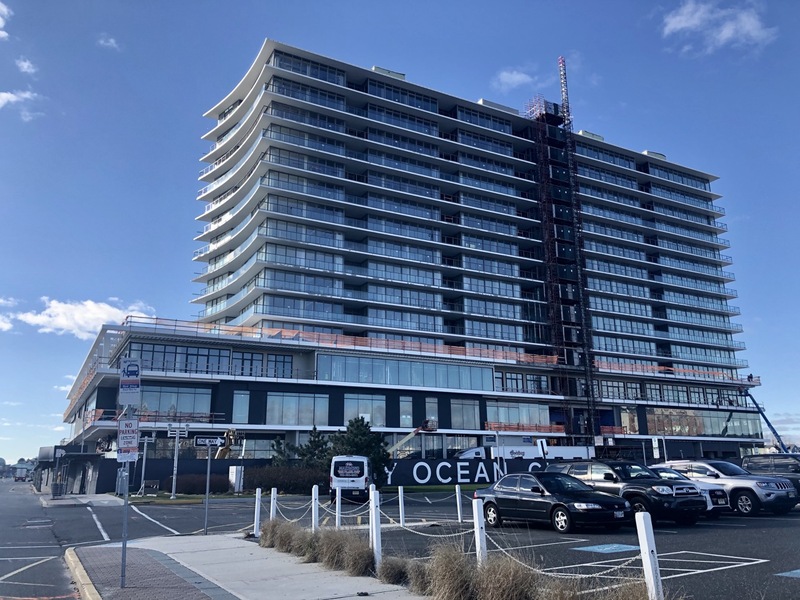 The Asbury Park Press referred to this iStar project as “The Changing Face of Asbury Park.” There are 17 stories, 130 condominiums— most over $1 million, and a hotel with 54 rooms. There will be parking within and a beach club. The skyline has already been dramatically altered, and that can be the subject of appreciation or scorn as seen from Ocean Grove. It will certainly signal a fundamental change in what the future will hold in that town. Most of the structures along the boardwalk in A. Park are one or two stories. But now, will iStar get greedy and plan to demolish those buildings and put up more view-blocking and congestion-creating buildings along the ocean? The lure of great wealth might result in Asbury Park’s becoming Long Branch. And will some of those commercial smoke signals be read in the Grove where the future North End design is currently being plotted by money driven developers and politicians, some of whom are Ocean Grovers. It remains to be seen whether there are 130 buyers for million dollar condominium units in Asbury Park. There is a wide gulf between visiting a city for a weekend because it has recently received favorable press and making a major financial commitment to purchasing a million dollar plus vacation home there. This is a beautiful building, but it is incongruous in this neighborhood. If I were spending that much money for a condo, it would not be in Asbury Park, which is still weak as a year round community. I would head for Miami Beach. There are many more than 130 people who will buy a million dollar view of the Atlantic Ocean on the Beach in Asbury Park. Just take the elevator to any residential floor and take a look. There are also many more than 130 people who will buy a million dollar view of the Atlantic Ocean on the Beach in Ocean Grove. But will the Township approve such a building in OG? Wake up people! Mayor Williams and the Committee, just did, and on a lot next to “Founders Park” where Ocean Grove was born in a tent in 1869. Jack – We just don’t have enough people to care enough to stand up and have a voice. It’s just happening un-opposed.